In 9703 BCE, “in the Whiteland, at the Earth’s bottom, off its foundation, the [Antarctic] icesheet slipped. By Nibiru’s netforce it was pulled into the south sea. A tidal wave arose, northward spreading.” “The tidal wave, several hundred metres high, moved northward from Antarctica at 500 km per hour, like a giant circle around the world; it destroyed all lands lower than 2,000 metres above sea level. 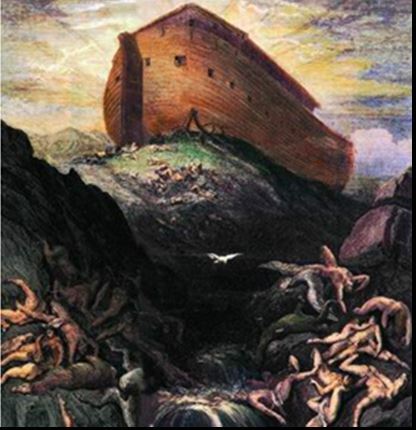 “The boat of Ziusudra the tidal wave from its moorings lifted, then plunged beneath the raging waves. Though completely submerged, not a drop of water into it did enter. For forty days, waves and storms swept Earth, downing everything on the planet except those on mountaintops and in Ziusudra’s boat. Ninagal surfaced, raised sail and steered to Mt Ararat” or “Mount al-Judi, the modern Cudi Dag, close to the Turkish-Syrian border” [Enki: 227; Slave Species: 472, 473; Collins, 2014: 263]. “The orbiting Anunnaki surveyed the flood’s results. “Enlil the survivors saw, Enki’s son Ninagal among them. “‘Every Earthling had to perish’ he with fury shouted. His scheming brother Enki, he saw, defied him, disobeyed his order to let all Earthlings drown. Nibiru’s perigee threatened the survival of the Anunnaki on Earth, critical for its gold for survival on the homeplanet. The perigee also, he’d heard on his comm unit, again had torn away Nibiru’s shield of gold powder. Ninurta and Ninmah restrained the raging commander. Enki told them he’d seen Galzu in a dream, then, when he woke, found next to his bed, a file that showed how Ziusudra should build the sub. Together, Enki, Ninurta and Ninmah convinced Enlil “The survival of mankind the will of the Creator of All must be. “Only when Enki put his arguments at a pragmatic level that the egotistic Enlil could understand explains that ‘the seed of mankind’ is the survival asset of the Anunnaki, and it is in their interest to have Earthlings to repopulate the Earth, does the infantile Enlil start thinking. Expedition leaders got Enlil to rule through Ziusudra and Shem, Japhet and Ham (Ziusudra’s sons) and their descendants. [DNA 113 to 115; Enki: 228, 229]. To Baalbek Lebanon’s surviving Landing Platform, Enlil summoned Anunnaki who survived the Flood on the Earth’s peaks and the astronauts in spacecraft orbiting the planet. Enlil kept Nippur, Sumer’s center, and there stored his computer programs, “Tablets of Destinies” and the “Command and Control Center” for Earth to off-planet communication, as well as the Bond-Heaven-Earth in his highrise stepped pyramid. In the city, Enlil had Earthlings built schools of science and scribing as well as a library with 30,000 inscribed clay tablets. He ordered a new rocket terminal built at Sinai, on the Arabian Peninsula, for spacecraft to freight gold to Nibiru. He told Enki and his lineage to build the new terminal, Mission Control and guidance facilities in a mountain-like Great Pyramid at Giza, near the Nile at the 30th Parallel [Time: 80; Wars:125; Giants: 67–69]. Enlil gave lands east of Sinai to two of Ziusudra’s sons, Shem and Japheth. Descendants of these sons served royals of Enlil’s lineage. The commander gave Africa to Enki and his lineage. Enlil ruled that Enki’s earthlings, Ziusudra’s son Ham and Ham’s descendants, must stay in Africa. Enlil feared revolt by the hundreds of thousands of Earthlings and ordered the Anunnaki to conceal Earthlings’ part-Nibiran genealogy from them. Ham’s descendants defied Enlil and moved north, out of Africa and into Canaan (Israel, Jordan, Lebanon and southwest Syria) on the Mediterranean side of the Arabian Peninsula. 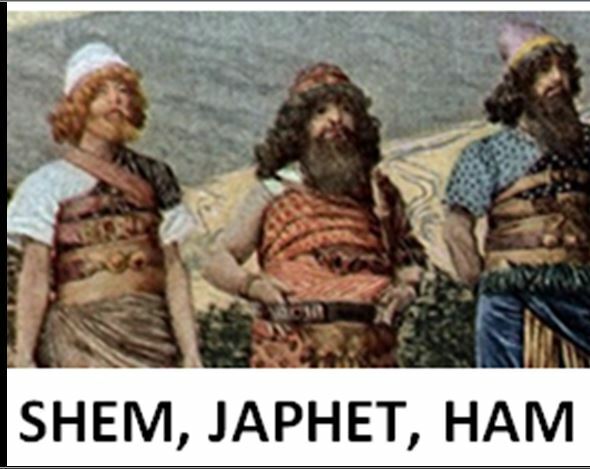 Ham ignored Enlil’s order they stay in Africa; they joined Enki’s grandson Seth in Canaan. Seth soon ruled Canaan. Seth’s rule in Canaan meant Enkiites controlled the Giza Spacecraft Marker-Pyramid, the control tower and runways on Sinai, and the new Mission Control Jerusalem. 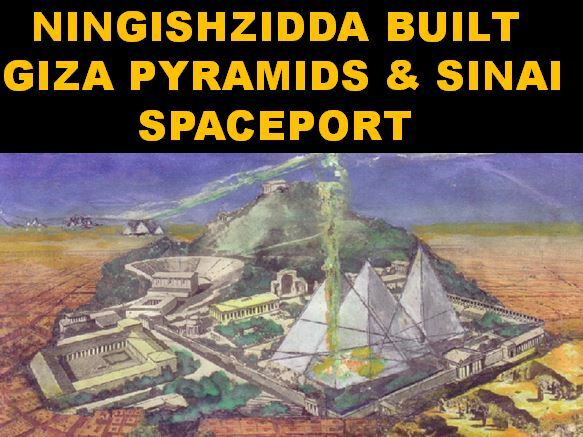 Enlil’s grandson Ningishzidda built two pyramids in Egypt. First Ningishzidda built a model, then the Great Pyramid. Then he built the Great Pyramid over the records of the Anunnaki, inscribed on emerald tablets, in a secret chamber, the Halls of Amenti. He installed Anunnaki’s master computer programs and astronavigational equipment in the Great Pyramid and configured the pyramid itself as a communication device, the Bond-Heaven-Earth, that could exchange messages with Nibiru and let Nibiru watch events on Earth. 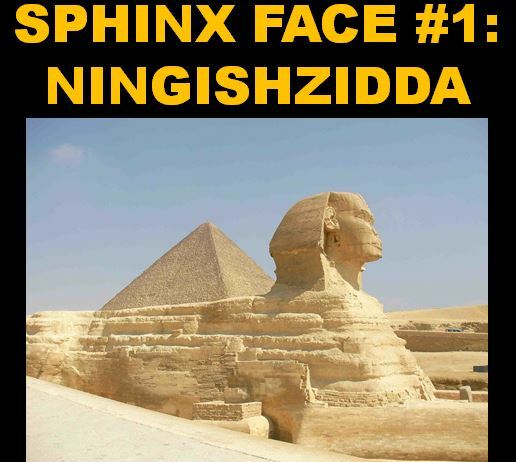 Marduk protested that Ningishzidda’s face on the Spinx was Ningishzidda’s. The Sphinx, in the territory of his father Enki, said Marduk, should be faced with his or one of his descendants. Marduk also fumed that Enlil chose Utu to run the Sinai Spaceport on the 30th parallel. The 30th separated the realms of the Enlilite Lineage (North of 30) and Enkiite (South of 30) [Enki: 238; DNA: 177]. Enlil feared Enkiites would run Earth’s space facilities, dictate gold flow from Earth to Nibiru, and with this leverage, force Marduk’s rule on Nibiru as well as Earth. Enlil wouldn’t be able to talk with Nibiru or flee Earth when they quit mining if Marduk won the space sites. To counter this, Enlil sent Ninurta to covertly construct a communications center for a rocket-landing field in South America, where Enlilites could gather placer gold and pure tin. The new center, next to Lake Titicaca, could control the long level plain of Nazca above the Andes. “From there,” Ninurta reported, “gold shipments to Nibiru can continue, from there in need we too can ascend” [12th Planet: 248, 249]. Enlil, letting others do the fighting for him, sent his sons Ninurta Adad and his granddaughter Inanna and grandson Utu against the forces of Enki’s sons Marduk, Nergal and Seth’s forces in Canaan. Ninurta, in a new jet with a 75-foot wingspan, blasted Marduk’s strongholds “while Adad roamed behind the enemy lines” and wasted the fish, cattle and food of the Enkiites and their armies. Ninurta shot poison missiles on the Africans. Marduk’s Earthlings retreated into the mountains but Inanna blasted them with “an explosive beam that tore them apart” and forced them south. Ninurta then led the Enlilite forces’ “attack on the heartland of Nergal’s African domain and his temple-city Meslam. They scorched the earth and made the rivers run red with the blood of the innocent bystanders, the men women and children of the Abzu. Ninurta rained poison-bearing missiles on Meslam and leveled the city. Survivors fled to nearby mountains. But Ninurta “with the Weapon that Smites threw fire upon them, smote down the people.” Utu held off the Igigi in Sinai. Nergal “broke through Ninurta’s lines and came to Marduk’s aid. Nergal strengthened the pyramid’s defenses through ray-emitting crystals positioned within.” But Marduk’s brother Ningishzidda refused to defend him. Marduk’s other brothers, Ninagal and Gibil, his father Enki and Marduk’s grandson Horon joined Marduk in the pyramid. The Enkiites made their stand together in the Giza Pyramid. Utu cut off the water source to the Enkiites in the Pyramid. Horon, disguised as a ram, slipped out of the pyramid but Ninurta blinded him with his “Brilliant Weapon.” Enki radioed Ninmah to stop the fight and save Horon. 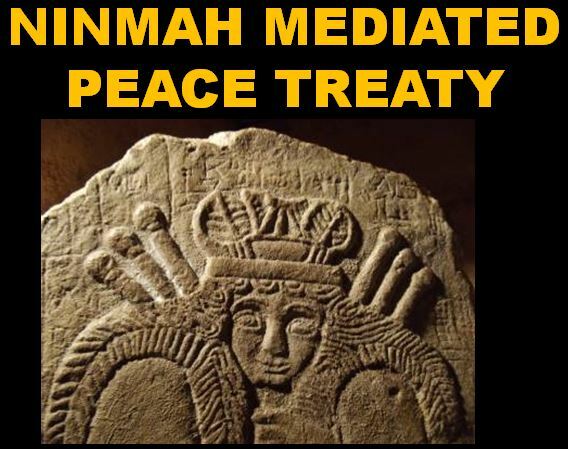 Ninmah, sister of both Enlil and Enki, lied that Anu ordered a ceasefire then a peace conference. Enki hesitated, “Out shall we come if to a peace treaty between our lineages Enlil commits.” But he gave her his hand. Ninmah led him and his lineage loyalists to the Harsag, her abode in the Harsag. The Enlilite gods were there, waiting. “Find peace. We, descendants of Anu all, must of warring cease,” Ninmah urged. Enlil gave Enki a peace-offering: Eridu (Basara), a large area with fruit trees and seeded fields. Ninurta objected; Eridu would give the Enkiites a foothold in Sumer. But Ninmah told Ninurta to drop the issue and he obeyed. Enlil agreed to stop attacks if the Enkiites and the Earthlings descended from Shem left Canaan’s Restricted Zone (Sinai Peninsula and Spaceport) and Jerusalem. So Enki replaced Marduk as Egypt’s ruler with Ningishzidda, Enki’s son with Enlil’s granddaughter Ereshkigal. Ningishzidda had refused to fight for Marduk and Enki against Ereshkigal’s paternal uncle, Ninurta. The Enlilites could accept Ningishzidda, though an Enkiite, to rule Egypt, since his mother, Ereshkigal, was an Enlilite. Both lineages accepted Ningishzidda as Nile Delta ruler. Ninurta broke or looted 54 large crystals that spiraled energy up, around out the top of the pyramid to rockets and to Nibiru. Enlil ordered all astronavigational communications and guidance equipment stay in lands he and his Enlilites ruled. Astronauts who’d sided with Marduk must leave the Landing Place in Lebanon as well as Canaan. Treaty concluded, Enki and sons left for Africa [Wars: 156 to 176, 178-180; Dunn, 2014; DNA: 71; Sereda: 2012; Enki: 260, 262]. Enlil, Ninurta, Adad, Nannar and Nannar’s wife Ningal sat with Ninmah to hear Enlil divide Enlilite territory and hear who he’d appoint to rule Sumer, Lebanon and Canaan. Ninurta (Enlil’s declared successor) and Nannar (Enlil’s firstborn by Ninlil, his legal spouse) clashed. Enlil had made Ninurta Champion and made Nannar, who’d supported Anzu’s rebellion, swear loyalty to the champ. Then Enlil banished Nannar from Ur. Now, however, Nannar’s wife Ningal got Enlil to restore Sinai, Canaan and Syria to Nannar. Enlil kept Adad as chief in Lebanon and the Landing Place at Baalbek and lands north, south and east of Lebanon (where Igigi astronauts and their hybrid families lived). Inanna erupted when Enki chose Ningishzidda to replace Marduk as Lord of Nile Lands. She and Dumuzi, whom Marduk had killed, she shouted, should’ve ruled the Upper Nile. “Against Marduk the war I led; that entitles me to my own domain,” she roared. The Enlilite leaders beamed Anu on Nibiru. He’d not visited Earth for 7000 Earth years. 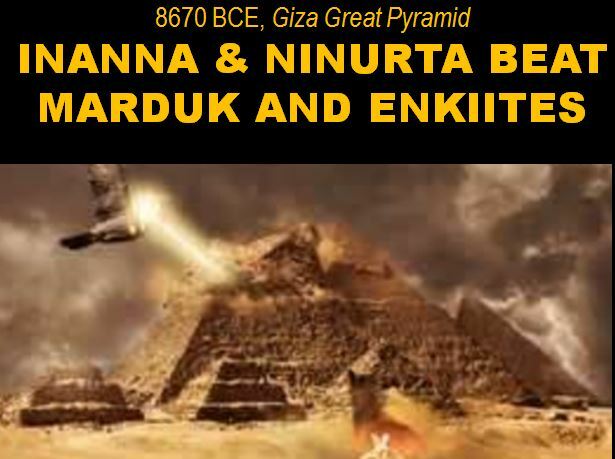 “To Earth come,” Enlil pleaded, “Deal with Inanna.” For Anu’s visit to Earth, they built Unug-ki, a temple in Uruk where neither Enki nor Enlil ruled. Enlil, Anu, Ninmah and Enki realized the Creator of All had, via Galzu, ordained they protect and develop the hybrid Earthlings they created in the lab and in bed. They decided: “Knowledge Mankind to provide. Cities of Man to establish, therein sacred precincts abodes for the Anunnaki create. Kingship as on Nibiru on Earth establish, crown and scepter to a chosen man give, by him the word of the Anunnaki to the people convey, work and dexterity to enforce; in the sacred precincts a priesthood to establish, the Anunnaki as lofty lords to serve and worship. Secret knowledge to be taught, civilization to Mankind convey.” [Enki, 271, 272; Giants:127]. Region 1 was reserved for Enlil’s lineage; Enlil chose kings, men descended from Ziusudra’s sons, Shem and Japhet, through whom they ruled Sumer. By 7400 BCE Shem, and his successors ran nations from the Persian Gulf to the Mediterranean. Around 3800 BCE, Shem’s descendants settled the ex-spaceport area of Iraq and the Landing Place at Lebanon. Japhet’s issue ruled lands in Asia Minor, the Black and Caspian Sea areas, as well as the nearby coasts and islands, as they recovered from the flood. Region 2 was reserved for Enki and his lineage. Anu ruled that Enki and his descendants would rule Egypt and Africa though successors of Ziusudra’s son Ham. Ham’s line ruled Canaan, Cush, Mizra’im, Nubia, Ethiopia, Egypt, and Libya from the highlands and spreading to the reclaimed lowlands. Region 3, the King declared, would be Inanna’s. She would rule the Indus Valley to settle around 2800 BCE as a grain source for the other regions. Region 4, Tilmun (Sinai) was Ninmah’s and was reserved for Anunnaki and their descendants . 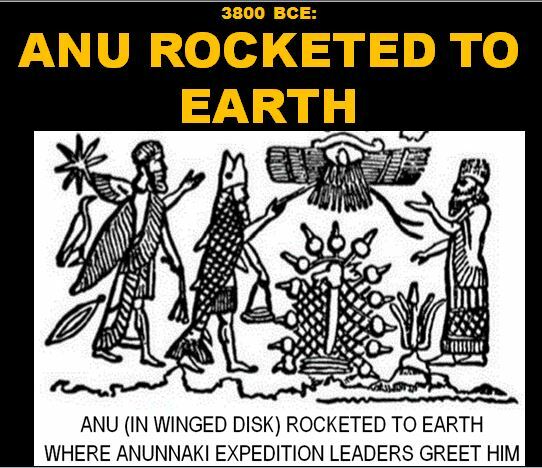 After Anu and Antu flew back to Nibiru from the new spaceport at Tiahuanaco, their rocket filled with gold, Marduk raged at the regions of influence Anu gave his rivals. Marduk said Inanna blamed him for Dumuzi’s death which she herself caused. Now, Marduk whined, Inanna consorted with Anu, who gave her reign over the Indus Basin, as well as Uruk in Sumer. Enlil told Adad to guard the Enlilite South American facilities from Marduk while the other Nibiran Earth Mission leaders returned to Sumer. Enlil named the era, his, “Age of the Bull.” He had his sons and grandsons declare themselves and other Anunnaki descendants “gods.” Mixed Anunnaki and Earthlings were demigods, who would direct Earthlings to build temples and cities to serve the gods. He ranked the gods. His father, King Anu, he ranked 60. He numbered himself and his successor, Ninurta, 50s. Enlil ranked Enki 40, Ninghzidda 52, Nannar, 30. Nannar’s son Utu ranked 20, Utu’s sister Inanna, 15 [Enki: 268, 271, 272, 275, 276; Wars: 193, 194, 129 to 135; Freer, 2004a; Enki: 271, 272]. He had Bab-il’s Earthlings built a “tower whose head shall reach the heavens, a launch tower. Marduk’s Igigi allies who’d seized Earthlings at Marduk’s wedding ran great fiefs in Lebanon and Sumer. Their estates and the number of their Earthlings grew as the Igigi bred with each generation. Marduk’s son Nabu gathered Earthlings and Marduk taught them to make bricks for his spaceport. With his own launch tower at Bab-il, he’d challenge the Sinai Spaceport Utu ran. 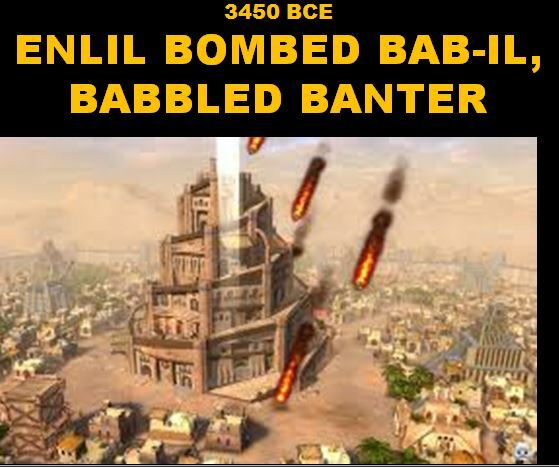 In 3450 BCE, Enlil had Ninurta bomb the tower and Marduk’s camp at Bab-il. Marduk fled to Enki’s other domain on the Nile. The Enlilites scattered Marduk’s Earthlings and programmed them to different languages and scripts [End: 22; Encounters: 110 to 115; Enki: 281, 282].